The well-known Crysis mod Mechwarrior: Living Legends is halting development, but its creators insist that there is no legal beef with Mechwarrior Online. Mechwarrior: Living Legends, the fan-made Crysis full-conversion, has been kicking around for a few years, and while it never got a "full" release, fan mods tending to stay in beta forever as they do, and despite being a fairly popular mod, the developers announced a few days ago that version 0.7.0 would be the final release. 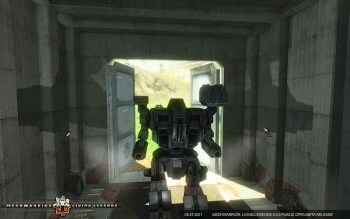 "We don't close our doors feeling any regrets; we close our doors knowing we've provided one of the most unique and in-depth Battletech/MechWarrior experiences ever created; with gameplay innovations and graphical fidelity that matches and even surpasses many AAA titles to this date," developer "Defender" said in a farewell message. "There will never be another experience quite like this." So why shut it down? Nobody has actually said, but a not-entirely-unreasonable conclusion drawn by some seems to be that some kind of legal dispute between the Living Legends crew and Piranha Games, the studio behind the free-to-play Mechwarrior Online, is responsible. Both sides, however, insist that's not actually the case. "First and foremost there has not, nor has there ever been, any legal action or threat of legal action leveraged against the MechWarrior: Living Legends development team. This was an assumption of a small amount of volunteers based on incomplete information," Living Legends developer "Criminal" explained in a followup message. "To clarify, the decision to discontinue development of MechWarrior: Living Legends was made by the founders and owners of the project. On behalf of all the people involved in MechWarrior: Living Legends we must sincerely apologize to all parties affected by this miscommunication." In his own message on the Mechwarrior Online forums, Piranha Games President Russ Bullock insisted that his studio did not send a cease-and-desist letter to the Living Legends team. Bullock said he ran into the "mod leadership" at the 2012 Game Developers Conference, where they discussed the future of the Mechwarrior franchise as a whole. "At this GDC in casual unscripted conversation I asked him 'Why are we splitting the community at this point?' We both realized that the MWLL community was small and it really wasn't competing with MWO but still each time a feature was added to MWLL that was in MWO it felt as though we were doubling up effort to restore this great brand," Buloock wrote. "I expressed that we were not trying to shut anyone down but asked him how we might meld the two communities better and even look to possibly hire on any great talent what was in that project... For a long time the IP was in the wind and MWLL is one of those games that really kept MW on peoples minds so the project and the individuals have our utmost respect." "We discussed this topic for a little while but again it was friendly and there was no threats of shutting the mod down just more of a sense of 'Why are we doubling up efforts here? '," he continued. "After the show he contacted me expressing that they really wanted to finish what they started with MWLL and had a set of features that they would like to get done and asked if that was okay with PGI. They presented a very professional plan on the remaining work they wanted to complete and stated after that it would be time to stop production on MWLL. I thanked them for the plan and said that it all sounded great." Bullock said he would get in touch with his Mechwarrior: Living Legends contact and update if anything else came to light, adding, "There was no combative relationship between MWO and MWLL, nor was there a cease and desist letter given." The final Mechwarrior: Living Legends update can be had at mechlivinglegends.net.